What a glorious Easter Saturday at Penrose parkrun today. The course was stunning as the carpet of bluebells have blossomed and the sun was shining through the trees which obviously boosted parkrunners as the first 5 across the line recorded personal bests with many more PB's to follow during the rest of the morning. We had a whole host of local runners plus visitors from far and wide; across the border (Tavy and Ivybridge I believe), Kent, Leeds, Cheshire, Newcastle and Peterborough to name a few. There were bunny ears a plenty and thanks to our parkrun volunteers we were lucky to have had a visit from the Easter Bunny with some sweet treats after. Our regular 'guess the total of parkrunners' comp was won by today's co-RD Jess...who was one out with a guess of 356. Well done Jess on a great job as run director AND winning this too! Good work bunny! This week 356 people ran, jogged and walked the course, of whom 97 were first timers and 61 recorded new Personal Bests. Representatives of 44 different clubs took part. Today's full results and a complete event history can be found on the Penrose parkrun Results Page. The female record is held by Grace BROCK who recorded a time of 16:32 on 29th December 2018 (event number 197). The male record is held by Peter LE GRICE who recorded a time of 14:38 on 1st January 2019 (event number 198). The Age Grade course record is held by Emma STEPTO who recorded 93.43% (17:31) on 25th August 2018 (event number 178). Penrose parkrun started on 28th March 2015. Since then 8,291 participants have completed 37,349 parkruns covering a total distance of 186,745 km, including 7,808 new Personal Bests. A total of 329 individuals have volunteered 2,774 times. It was a fine morning but with a chill in the air, a few volunteers were feeling it in their fingers. A fairly big turnout, thanks to a good number of tourists, fortunately everything went smoothly, again thanks to our great volunteers. This week 254 people ran, jogged and walked the course, of whom 60 were first timers and 49 recorded new Personal Bests. Representatives of 30 different clubs took part. Penrose parkrun started on 28th March 2015. Since then 8,194 participants have completed 36,993 parkruns covering a total distance of 184,965 km, including 7,747 new Personal Bests. A total of 328 individuals have volunteered 2,752 times. Today we had a fantastic turnout by our pacers for their various times. Believe me when I say it's harder than it looks, many did a little spin around before crossing the line. Our pacers are at Penrose on the first Saturday of every month. This week 228 people ran, jogged and walked the course, of whom 32 were first timers and 46 recorded new Personal Bests. Representatives of 21 different clubs took part. Penrose parkrun started on 28th March 2015. Since then 8,134 participants have completed 36,739 parkruns covering a total distance of 183,695 km, including 7,697 new Personal Bests. A total of 328 individuals have volunteered 2,736 times. It was our 4th birthday today and 9-year-old Holly's 150th parkrun! Our theme was superheros and there were plenty of runners in fancy dress to celebrate with us! We had our usual influx of tourists from various UK locations including Bristol, Lee-on-Solent (Portsmouth way), Milton Keynes, amongst others! We've had to introduce a new rule at Penrose which is that children cannot ride bikes or scooters within the parkrun as we've had a number of incidents over the past few months regarding this including parents who think that their child should get a result even though they haven't run it! This week 278 people ran, jogged and walked the course, of whom 36 were first timers and 49 recorded new Personal Bests. Representatives of 31 different clubs took part. Penrose parkrun started on 28th March 2015. Since then 8,102 participants have completed 36,511 parkruns covering a total distance of 182,555 km, including 7,651 new Personal Bests. A total of 325 individuals have volunteered 2,714 times. Many people have waxed lyrical about the beauty of Cornwall, and quite rightly so. For Steph living in Plymouth it is only a hop and a skip over the River Tamar. For Claire living in Taunton it is more of a trek, but nothing fills our hearts more with joy, than seeing the ‘Welcome to Cornwall’ sign as we cross the border from Devon. 06:30 marked the start of our voyage from Plymouth to Penrose parkrun this morning, arriving at the beautiful picturesque lake next to Penrose estate. The Penrose Estate, which is owned by the National Trust, features woodland tracks, stretches of coastline and open parkland all centred around Loe Pool which is Cornwall’s largest natural freshwater lake. Loe Pool is cut off from the sea by a broad shingle bar, heaped up by heavy atlantic seas. Loe Bar is the site of many historical shipwrecks, and reportedly is where King Arthur was mortally wounded and died. The National Trust ‘Stables Cafe’ is open every day from Easter til October, and luckily for us parkrunners, weekends over winter. We chose to visit the Lakeside Cafe afterwards however, which boasts lovely views of the lake. Toilets and a large free car park nearby make this an attractive choice for parkrun tourists and you can even feed the ducks! We were given a friendly welcome from the RD, and we chatted in the meadow whilst waiting for the run briefing. There were lots of people of all ages, dogs and buggies, all raring to go! After a slightly congested start, we were off, bounding through the woods and along the scenic estate. The path was mostly flat and smooth in surface, making it ideal settings for a PB. Road shoes are suitable for this course, and although it is a tarmac path, it feels like a trail parkrun. The views throughout were beautiful, and well worth the early start for us! At event #210 today, 232 people walked, jogged or ran their way around the course. Samuel Goodchild was first male back with his time of 17:21 and Ruby Lily Orchard was first female with her respective time of 18:56. The female record is currently held by Grace BROCK, who recorded a time of 16:32 on 29th December 2018 and the male record is currently held by Peter LE GRICE, who recorded a time of 14:38 on 1st January 2019. The large contingent of walkers at the back was so encouraging to see, we think Mr Sinton Hewitt would be proud of how inclusive parkrun has become for everybody, regardless of speed. Claire was walking today due to injury (apparently 26 marathons isn’t a good idea - who knew?!) but she definitely deserved her coffee and cake afterwards. One thing worth mentioning is it’s important to remember that parkrun is for everyone, whether they want to walk, run, jog or dance their way around the course. We are all participating for the same or similar purpose; therefore everyone should be treated equally and fairly. Respect your fellow parkrunner! Since Penrose parkrun started on 28th March 2015, 8,066 participants have completed 36,233 parkruns covering a total distance of 181,165 km, including 7,602 new Personal Bests. A total of 324 individuals have volunteered 2,698 times. Penrose will be celebrating its 4th Birthday next Saturday March 30th, and the theme will be superheroes. So dust off your capes and work on your superhero powers ready for next week. Please also note that tomorrow, Sunday March 24th there will be a National Trust organised free 10k trail run.This is part of a series of runs held on the 4th Sunday of every month, which allows you to explore the Godolphin’s wider estate. Registration is at 08:30 with the run starting at 09:00. The Piggery will be open for tea, coffee and cake from 10:00. If that isn’t enough to tempt you, we don’t know what is! See https://www.nationaltrust.org.uk/events/4fd801ad-87b1-419b-bb1a-1f6a37ce1cfd/pages/details for details. Volunteering is a fun and rewarding way to be part of the parkrun family so if you haven’t already tried it, please do! There are so many roles to choose from that you are bound to find something that you feel comfortable with. The 36 people who visited for the first time today, 14 of whom did their first ever parkrun today! Welcome to the parkrun family. No 50 tee’s earned today but Rachael Hilliard will get hers on her next parkrun! Congrats to Tim Hayden who did his 100 milestone parkrun today! Special mention to Sally Woodward Gentle who has done a whopping 456 parkruns!! 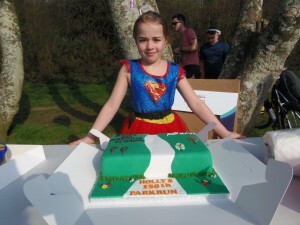 Her 11th parkrun Birthday will be on April 12th. All that is left for us to say is a big thank you to you all for having us, and if you ever feel like touring a little further away, you will receive a very warm welcome at either Plymvalley or Longrun Meadow parkruns.